Tuberculosis is a major challenge to health in the developing world. Triage prior to diagnostic testing could potentially reduce the volume of tests and costs associated with using the more accurate, but costly, Xpert MTB/RIF assay. An effective methodology to predict the impact of introducing triage prior to tuberculosis diagnostic testing could be useful in helping to guide policy. The development and use of operational modelling to project the impact on case detection and health system costs of alternative triage approaches for tuberculosis, with or without X-ray, based on data from Porto Alegre City, Brazil. Most of the triage approaches modelled without X-ray were predicted to provide no significant benefit. One approach based on an artificial neural network applied to patient and symptom characteristics was projected to increase case detection (82% vs. 75%) compared to microscopy, and reduce costs compared to Xpert without triage. In addition, use of X-ray before diagnostic testing for HIV-negative patients could maintain diagnostic yield of using Xpert without triage, and reduce costs. A model for the impact assessment of alternative triage approaches has been tested. The results from using the approach demonstrate its usefulness in informing policy in a typical high burden setting for tuberculosis. There were an estimated 1.7 million deaths and 10.4 million new cases of tuberculosis (TB) in 2016 . The standard diagnostic approach for pulmonary-TB relies on sputum smear microscopy (SSM), but published research shows that SSM has limitations . These include accuracy (sensitivity 20–80%) , the time taken to complete diagnosis and start treatment (4–20 days)  and the related costs [5–7]. New diagnostic algorithms to improve accuracy and early diagnosis of TB, including detection of resistance to TB drugs, are required . Xpert MTB/RIF (Xpert) is a rapid, automated molecular test that can detect TB with higher sensitivity (83 to 92%) and, at the same time, resistance to rifampicin . However, due to the high cost per test, implementation of Xpert in many countries is limited . As an example, Porto Alegre City in Brazil is a high prevalence setting for TB with high levels of HIV-coinfection . Data collected in 2011 as part of the Policy Relevant Outcomes from Validating Evidence on Impact (PROVE-IT) study in Brazil  showed the prevalence of TB among presumptive-TB cases at primary health care facilities was 15.8% with HIV coinfection at 44.8%. Recent research showed 4.7% of smear-positive pulmonary-TB cases were multi-drug resistant . Porto Alegre is a city where implementation of Xpert could have a significant impact on reducing the TB burden. Currently all presumptive-TB cases are diagnostically tested for TB. If a nurse or clinician could identify using characteristics of the patient and their symptoms (triage) some of the individuals that do not have TB, then the number of diagnostic tests conducted could be reduced, saving cost and speeding up access to TB treatment for those where it is needed [13, 14]. Operational modelling has been used to project health system and patient impacts of introducing new diagnostic algorithms [15–17]. Such an approach could be used to evaluate the impact of triage prior to seeking a diagnosis. This study investigates the use of operational modelling to predict the impact of seven potential alternative approaches to triage (including no triage – base case), with or without X-ray and in combination with the Xpert diagnostic test. The projected outcomes were compared to a base case of sputum smear microscopy without triage or X-ray prior to diagnostic testing. For this study an operational model was chosen as it could be designed to fully represent the current and potential future patient pathways for diagnosis in Porto Alegre using a visual and interactive model that could engage decision makers. The activities of triage, sputum collection, diagnosis, clinical assessment and treatment initiation were modelled. Waiting areas for patients along with the human resources required for each activity were represented in the model. A snap shot of the screen layout for the developed model is shown in Fig. 1 including a description of the patient pathways. The model was developed using the discrete event simulation (DES) package – WITNESS® . There are five key elements that need to be defined within any WITNESS® DES model. The first of these are ‘entities’ representing either people or objects moving around a process. These entities have ‘attributes’ which can be used to represent either static or changing features of the entity (e.g. quantity, TB status, patient unique identifier, and time in a particular process). Entities travel through ‘activities’ (representing processes where time and resources are involved) and ‘queues’ (representing waiting areas before activities). Activities can be associated with ‘resources’ such as staff. More detail on the structure of the model is in the online appendix. The dynamic and visual representation of the process facilitated validation and calibration of the model. Data from January to December 2012 were collated for Porto Alegre City in Brazil, sourced in part from the PROVE-IT study  (Table 1) to populate and calibrate the model. Seven potential triage approaches for TB diagnosis were identified using literature review and expert interviews. These triage approaches were selected on the basis that they made use of information that would be readily available prior to performing a diagnostic test. For example, personal data such as age, HIV-status, and tobacco usage, and clinical symptoms such as cough, fever, chest pain, weight loss, haemoptysis and other respiratory symptoms [19, 20]. In addition, approaches that could combine this information to generate a predictive algorithm for active TB were considered . Algorithms such as a clinical score  developed using regression models or an artificial neural network (ANN) [23, 24] were identified. For these approaches, some computation would be necessary by the diagnosing health professional using a scorecard where points are allocated to individual or combinations of characteristics. Six potential alternative triage approaches with estimated sensitivity and specificity for active pulmonary-TB were identified (Table 2). For comparison purposes these included the theoretical target product profiles (TPP) for a triage test proposed by Denkinger et al. .
Scorecard based on aggregating scores assigned to respiratory symptoms including chest pain, cough, sputum expectoration, hemoptysis, night sweats, fever, shortness of breath and weight loss . Artificial Neural Network (ANN) based on using a multilayer perceptron (MLP) approach  to infer the probability of a patient having active pulmonary-TB from personal data and clinical symptoms i.e. age, gender, cough, fever, weight loss, smoker, night sweats, hospitalisation, chest pain, dyspnea, and hemoptysis. Additional data used in the model is detailed in the online appendix. Chest X-ray is also an approach commonly used by programmes for triage. Therefore, we also considered X-ray in combination with other triage algorithms as a tool to ensure all patients with X-rays suggestive of TB would receive a diagnostic test [26, 27]. 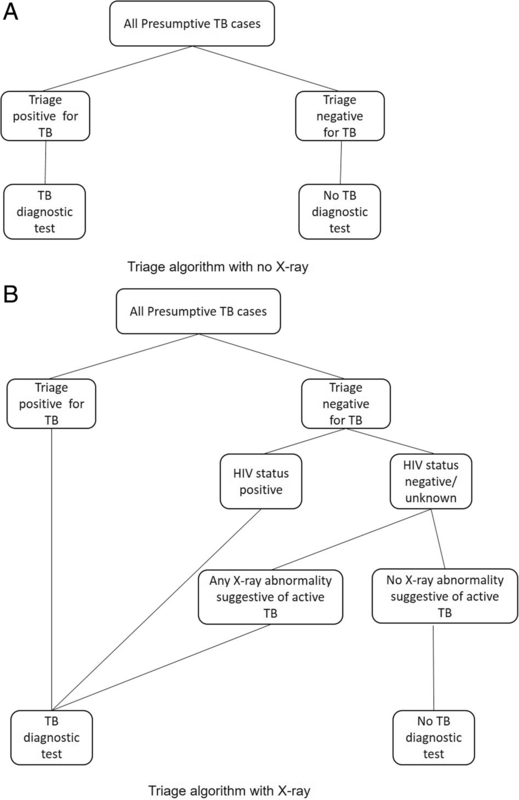 We modelled an X-ray algorithm as a potential add-on to triage for HIV-negative (or unknown status) presumptive-TB cases with any abnormality suggestive of active TB. In these scenarios, it was assumed all HIV-positive presumptive-TB cases would go for laboratory testing due to the difficulty of detecting TB using X-ray in HIV patients (Fig. 2). In Porto Alegre two alternative diagnostic algorithms were considered for testing of presumptive TB cases. Presumptive-TB cases were defined as patients who present with symptoms or signs suggestive of TB at primary health care facilities in Porto Alegre City . The first diagnostic algorithm available was sputum smear microscopy based on two samples collected on different days followed by a clinical assessment for smear negative cases. The second diagnostic algorithm was based on a single sputum sample tested using Xpert MTB/RIF followed by clinical assessment for Xpert negative cases. Both these algorithms were modelled. The model projected the impact of introducing each alternative triage approach prior to the diagnostic test. Note the context here is triage of patients seeking a TB diagnosis rather than active case finding. The impacts on patients sent for diagnosis, TB cases identified, false positive diagnoses, time to diagnosis and resource usage were projected using the model. The case detection rate (defined as the number of patients with active TB disease that are diagnosed (bacteriologically confirmed or clinically diagnosed) and start treatment, divided by the number of presumptive TB cases with active TB disease). 95% confidence limits were calculated for the key outputs. Sensitivity analysis to the prevalence of TB in presumptive-TB cases was conducted. A unit cost to the health system was estimated for each test including triage, X-ray and diagnostic tests (Tables 1 and 2). The unit costs included staff time, consumables, cartridges, slides, running costs and equipment depreciation. They did not include fixed overhead costs (e.g. space) as these were assumed unchanged between tests. The additional cost per triage test was assumed to be low as the characteristics are those which clinicians will already consider. The X-ray and diagnostic costs were taken from the Prove-IT study in Brazil  which used an activity-based approach to take into account cost drivers relating to physical infrastructure, human resources, supplies (chemicals, reagents and consumables), and transport. The ratio of the increase in health system costs divided by the benefits in number of true TB cases starting treatment was also assessed as a measure to compare alternative triage approaches. Summary projections for the impact of introducing Xpert in Porto Alegre, with or without triage, for each of the modelled scenarios are shown in Tables 3 (without X-ray) and 4 (with X-ray). Presumptive TB cases receiving diagnostic test per yr.
For the base case of microscopy without triage, the projected volume of individuals starting TB treatment was 1238 cases per year (75% case detection rate). This included bacteriologically confirmed and clinically diagnosed cases and involved 10,281 patients being tested. The mean time from the patient arriving at the health facility to completing diagnosis was projected to be 6.0 days. Implementation of Xpert without triage was projected to have a significant impact over the base case. Case detection rate rising to 83% with a projected increase in the number of people with TB starting treatment of 137 (95% CI. 57, 217) per year and an increase in the annual diagnostic cost of US$581 thousand (95% CI. 555, 607). The mean cost per additional TB case treated was projected to be US$4242 (95% CI. 1371, 7111). The mean time to complete diagnosis was reduced by 1.0 day (5 days compared to 6 days). Implementation of Xpert alongside a triage test of excluding all cases with a cough of less than one week (T2) gave a projected case detection rate of 72% with a reduction in the annual number of patients with TB starting treatment of − 41 (95% CI. -118, 36) compared to the base case. Therefore, there would be no benefit of this option over the current standard diagnostic approach of microscopy. The same was true for implementation of Xpert alongside a triage test of excluding all cases with a cough less than three weeks (T3) – case detection rate dropping to 53%. Implementation of Xpert together with a triage test using a clinical score (T4) had a projected reduction in case detection rate to 70% with the annual number of people with TB starting treatment falling by − 90 (95% CI. -166, − 14), so despite the lower cost compared to Xpert without triage, this was not considered a useful intervention. Using the predicted sensitivity and specificity of the ANN (T5) as the triage test along with Xpert as the diagnostic test showed a significant increase in the projected case detection rate to 82% with an increase in the annual number of TB patients starting treatment of 131 (95% CI. 39, 223). Projected additional health system costs compared to the base case were US$367 thousand (95% CI. 351, 384) compared to US$581 thousand (95% CI. 555, 607) for Xpert without triage. This option therefore both increases case detection compared to the base case and would cost less than roll-out of Xpert without triage. Using a triage test with the performance of the theoretical optimal TPP (T6) with Xpert was projected to have a positive impact on case detection (80%), cost and time to complete diagnosis. The projected impact on the annual number of people with TB starting treatment was an increase of 82 (95% CI. 2, 162) with a significantly reduced annual health system costs to both microscopy -US$49 thousand (95% CI. -52, − 47) and Xpert without triage. Implementation of Xpert alongside a triage test with the minimal TPP characteristics (T7) was projected to have no significant impact on case detection rate (76%) or the annual number of TB patients starting treatment compared to microscopy. Figure 3a illustrates the projections from the model of each scenario with a positive impact on the number starting treatment compared to the base case. T6 (Optimal TPP) and T5 (ANN) are the most effective options with reduced cost compared to Xpert without triage. These results are based on the same scenarios as those detailed above, but with X-ray also used as an additional triage tool for HIV-negative (or HIV status unknown) presumptive-TB cases. For HIV-positive patients these options assume all presumptive-TB cases would receive a TB diagnostic test. Implementation of all the triage approaches with X-ray alongside Xpert as the diagnostic tool would have a significant positive impact on case detection rates compared to the base case (sputum smear microscopy without triage) i.e. 80–83% compared to 75%. As shown in Table 4 and Fig. 3b the projected increase in the annual number of TB patients starting treatment for most of the triage approaches matches the increase projected with no triage when Xpert is the diagnostic tool. The exception is T3 (cough for greater than three weeks) when the increase is smaller. Comparing the results in Table 3 (without X-ray) with the results in Table 4 (with X-ray) shows annual costs increase due to X-ray, an increase in the number of diagnostic tests, and additional treatment costs. However, the projected costs are still below Xpert without triage in all cases. In particular, T4 (clinical score), T5 (ANN), T6 (TPP- optimal) and T7 (TPP-minimal). Variation in the outcomes to the sensitivity and specificity parameters of the triage tests can be seen from the range of different triage tests modelled (i.e. sensitivities ranging from 61 to 98% and specificities from 19 to 80%). Additional sensitivity analyses to input parameters such as TB prevalence and costs of tests were also performed. The results of all the sensitivity analyses are shown in the online appendix. The ranking of options by effectiveness was unchanged by varying these parameters. Operational modelling can provide valuable predictions of the impact on case detection, health system costs and time to complete diagnosis of alternative triage approaches for TB diagnosis as shown by this study using data from Porto Alegre City, Brazil. The approach can bring together routine and trial data from the current program along with data from published and ongoing research to model current and potential future patient pathways which are critical to understanding patient and health system impacts in relation to cost and time, as well as yield. The WHO strongly recommends Xpert should be used as the initial diagnostic test in individuals suspected of having TB-HIV coinfection . In Porto Alegre, Brazil, where TB and HIV prevalence are high, the rollout of the Xpert test could have a large effect. However, Xpert is frequently only used as an add-on test to microscopy rather than for initial diagnosis due to its high cost per test. Our study confirms implementation of Xpert would provide a significant benefit over microscopy in terms of the number of patients with TB starting treatment in Porto Alegre City, with case detection rates estimated to increase from 75 to 83%. Introducing a triage approach prior to the Xpert test could reduce costs but would also reduce the number of TB patients starting treatment as some patients that fail the triage test would have TB and would have been identified by the diagnostic test if they had been tested. For example, a triage test based on cough for greater than 3 weeks could reduce the number of diagnostic tests by almost half, but would see many TB cases not being sent for diagnosis leading to case detection falling to 53%. Most of the triage approaches modelled when combined with Xpert did not provide any significant benefit over microscopy as the diagnostic test. However, one triage approach (T5- ANN) was found to significantly increase TB case detection (82% vs. 75%) compared to microscopy and reduce costs compared to Xpert without triage. This approach combines patient and symptom data in a score. This is an encouraging result, but before an ANN approach could be implemented further work is required to develop the appropriate data collection and computation procedures in the diagnostic centre. The model shows that X-ray combined with a triage approach prior to Xpert diagnostic testing could deliver almost the same case detection rate as would be achieved when no triage is used (i.e. 82–83%). This could be achieved at reduced costs compared to using Xpert for all presumptive-TB cases (i.e. no triage). For example, X-ray combined with the ANN is projected to reduce costs of the roll-out of Xpert to the TB programme by around US$130,000 per year in Porto Alegre city. This would require access to X-ray at diagnostic facilities, which may not be possible in some locations and would require further investigation. A triage test with the optimal TPP characteristics  would also be highly effective but is not available currently. The minimal TPP proposed was not effective as the number of TB patients starting treatment would not be increased. An additional observation from the modelled diagnostic and triage options is the effect on reducing false positive diagnoses (i.e. the number of individuals placed on TB treatment who do not have TB disease). This is an important observation as the consequences of false diagnosis for TB can be serious for the individual and the TB programme . As expected the use of Xpert as a diagnostic tool compared to microscopy can reduce the rate of false diagnosis particularly when fewer individuals are clinically diagnosed. Our results also indicate the use of triage can lead to reduced false positive diagnosis (Tables 3 and 4), especially if the specificity of the triage test is high (e.g. in triage tests T3, T4, T6 and T7). Our study was limited by the availability of some data. Assumptions were necessary from the literature and interviews with experts, for example in relation to sensitivity of clinical diagnosis and the new triage approaches as well as associated costs. In addition, it was assumed that the sensitivity and specificity of each of the tests (i.e. triage, X-ray, sputum smear microscopy, Xpert and clinical judgement) were conditionally independent. In particular, this may not be an accurate assumption for triage and clinical judgement as similar criteria may be used by the nurses and clinicians at triage and following a negative diagnostic test. However, this would not be expected to affect the levels of true TB identified through the diagnostic tests. Further analysis of the correlations between tests would be valuable research. We have not tested the approach in low-HIV or high MDR-TB settings, so further research is required here. The modelling methods used in this study could also be used to assess impacts on patient costs  and assessing the impact of different strategies for active case finding. Active case finding is likely to be essential if the TB epidemic is to be controlled and is therefore receiving increased focus from the WHO  and others [33, 34]. In conclusion, we have demonstrated that operational modelling as used for this study can provide insights into the impact of alternative triage approaches. In the context of Porto Alegre City, we have shown the introduction of a triage approach alongside Xpert could reduce the TB diagnostic costs of Xpert implementation whilst still significantly increasing the number of patients starting treatment compared to microscopy. Our study indicates that among the optional triage approaches modelled - T5 (ANN) has the greatest potential to improve outcomes whilst controlling costs to the health system. The optimal TPP  for TB triage is a theoretical set of performance characteristics for which no triage tools currently exist, but should it become available would be beneficial. Furthermore, adding X-ray as a triage tool for HIV-negative cases (and unknown status) alongside appropriate triage approaches could substantially save costs over Xpert without triage, whilst identifying almost as many cases. We thank Daniele Maria Pelissari and Patricia Bartolomay for their involvement and supply of data to support this study and the PROVE-IT study in Porto Alegre, Brazil. This research was completed as part of a Masters in Tropical Infectious diseases at the Liverpool School of Tropical Medicine that was self-funded.This document has been produced thanks to a grant from USAID. The contents of this document are the sole responsibilities of the authors and can under no circumstances be regarded as reflecting the positions of the International Union Against Tuberculosis and Lung Disease (The Union North America) nor those of its Donors. IL, AR and RG designed the study. AK and RG collated much of the data for the study. AR and IL conducted the modelling and data analysis. AR wrote the first draft of the manuscript with IL, ET, BS, AK and RG reviewing and amending the initial draft. All authors read and approved the final version of the manuscript. This is a retrospective study and no identifiable human subjects were involved in the research, therefore ethical approval was not sought and informed consent was not applicable. World Health Organization, Global Tuberculosis Report 2017. http://apps.who.int/iris/bitstream/10665/259366/1/9789241565516-eng.pdf?ua=1. Accessed 16 Mar 2017. Langley I, Squire SB, Dacombe R, Madan J, Lapa e Silva JR, Barreira D, Galliez R, Oliveira MM, Fujiwara PI, Kritski A. Developments in impact assessment of new diagnostic algorithms for tuberculosis control. Clin Infect Dis. 2015;61(Suppl 3):S126–34. https://doi.org/10.1093/cid/civ580. Albert H, Nathavitharana RR, Isaacs C, Pai M, Denkinger CM, Boehme CC. Development, roll-out and impact of XpertcMTB/RIF for tuberculosis: what lessons have we learnt and how can we do better? Eur Respir J 2016 Jul 13. pii: ERJ-00543-2016. https://doi.org/10.1183/13993003.00543-2016. Steingart KR, Sohn H, Schiller I, Kloda LA, Boehme CC, Pai M, Dendukuri N. Xpert® MTB/RIF assay for pulmonary tuberculosis and rifampicin resistance in adults. Cochrane Database Syst Rev. 2013;(1):CD009593 https://doi.org/10.1002/14651858.CD009593.pub2. Review. Update in: Cochrane database Syst rev. 2014;(1):CD009593. Ramalho DMP, Miranda PFC, Andrade MK, Brígido T, Dalcolmo MP, Mesquita E, Dias CF, Gambirasio AN, Ueleres Braga L, Detjen A, Phillips PPJ, Langley I, Fujiwara PI, Squire SB, Oliveira MM, Kritski AL. Outcomes from patients with presumed drug resistant tuberculosis in five reference centers in Brazil. BMC Infectious Diseases 2017;17:571. https://doi.org/10.1186/s12879-017-2669-1. Langley I, Lin HH, Egwaga S, Doulla B, Ku CC, Murray M, Cohen T, Squire SB. Assessment of the patient, health system, and population effects of Xpert MTB/RIF and alternative diagnostics for tuberculosis in Tanzania: an integrated modelling approach. Lancet Glob Health. 2014;2(10):e581–91. https://doi.org/10.1016/S2214-109X(14)70291-8 Erratum in: Lancet Glob Health. 2014 Dec;2(12):e697. Lanner Group, WITNESS Simulation Modelling, https://www.lanner.com/en-gb/technology/witness-simulation-software.html. Accessed 16 Jan 2019. Nguyen DT, Nguyen HQ, Beasley RP, Ford CE, Hwang LY, Graviss EA. Performance of Clinical Algorithms for Smear-Negative Tuberculosis in HIV-Infected Persons in Ho Chi Minh City, Vietnam. Tuberc Res Treat. 2012, Article ID 360852, 6 pages. https://doi.org/10.1155/2012/360852. Denkinger CM, Kik SV, Cirillo DM, Casenghi M, Shinnick T, Weyer K, Gilpin C, Boehme CC, Schito M, Kimerling M, Pai M. Defining the needs for next generation assays for tuberculosis. J Infect Dis. 2015;211(Suppl 2):S29–38. https://doi.org/10.1093/infdis/jiu821 Review. Langley I, Lin HH, Egwaga S, Doulla B, Ku CC, Murray M, Cohen T, Squire SB. 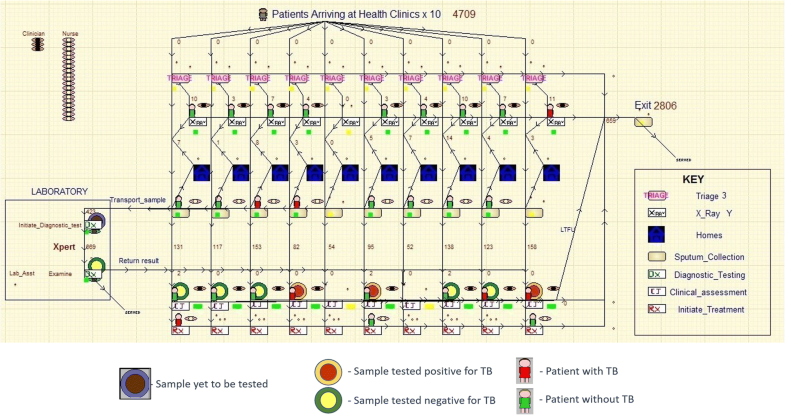 Assessment of the patient, health system, and population effects of Xpert MTB/RIF and alternative diagnostics for tuberculosis in Tanzania: an integrated modelling approach. Lancet Glob Health 2014; 2(10):e581–e591. https://doi.org/10.1016/S2214-109X(14)70291-8. https://www.thelancet.com/cms/10.1016/S2214-109X(14)70291-8/attachment/95e909c9-f712-4837-a799-29099e14108b/mmc1.pdf. World Health Organization. Global strategy and targets for tuberculosis prevention, care and control after 2015. 2014. Available from: http://www.who.int/tb/post2015_strategy/en. Accessed 11 Aug 2016.